I was thinking of the way ancient people used to write, using graphical symbols as glyphs. The thing which usually comes in mind is Egyptian hieroglyphics. The difference between our modern language and the Egyptian's is that our alphabets are just symbols for sounding while for them each symbol has had a meaning. When you see a picture of a man worshipping the sun, you can faster understand what this picture means rather than reading a line that says what this man is doing. Our mind doesn't like to (or can't) pay attention to the details easily, you have to force it to get focused. This is why we can read words have a typo, especially those had correct start and end, we may even don't understand they have spelling errors. Do you think that the brain is that fast when you pass the streets it scans any people, cars, and ... finds out the shape of them. I don't think so, it has a history of how a human or car looks like, and just by discovering some signs assumes that this is a car and that is a pedestrian. Just think about this example, when you seat in a car, looking out the window how fast you brain should be to process all the things you see in detail? "Are pictures worth a thousand words?" It is in our nature and blood. Now consider when it was the first time human started to write. It depends on the definition of writing, I found around 20,000 years ago, this is nothing comparable with hundreds of million years of using eyes for seeing things or viewing. Consider you want to describe how to change a part in a device. For example a hard disk in iMac (I've done it before) or replacing the injection pump in a car engine. Looking at a couple of pictures is faster, easier and more understandable than reading pages of text to know how to do these replacements. We can recall memories, events, things, and ... much faster if we have them correlated to a picture or scene. We even learn things when learning visually, as an English learner, I never forget a word if I see someone uses it in the real world. Everybody knows this when you use pictures to help better understanding as well as texts, the left side of the brain which is responsible for paying attention to details helps to read and the right side of the brains pays attention to visualization stuff you provided. This is the way you increase your brain usage efficiency. whole and detail together and helps to clarify ambiguities. You can bring so many reasons why a graphical presentation can be more useful than text presentation especially when texts are too long and the reader doesn't have time or power to read and digest all of them (this is why nowadays everybody looks for data-visualization of big data) but if you use both text and picture you'll give better understanding material to your customers. 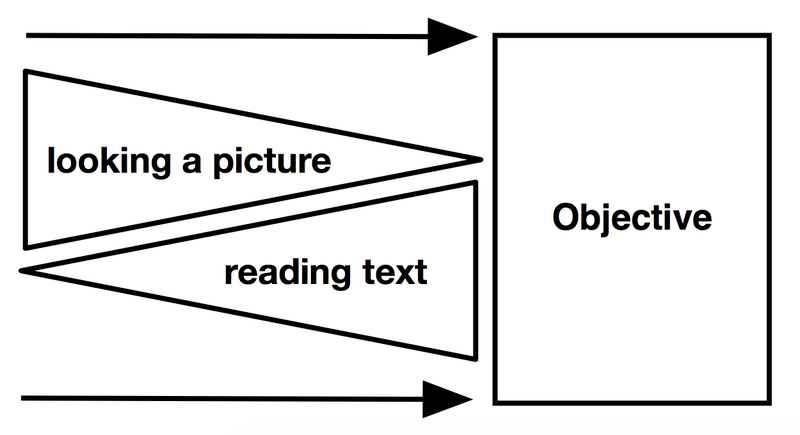 What I mean is that reading is like bottom up or detail to the whole process, while looking a picture is a top-down process, at a glance you get much information but not that detail reading can get. So using both together can surely reduce the problems we talked about ambiguity in language.